The rain dances its gentle tango on the roof of a boat that sways awkwardly along the inlet as we travel from Port Alberni to Ucluelet on Vancouver Island. I squint up at the misty sky in desperate hope that the clouds begin to dissipate and the rain begins to lessen its drizzle. My eyes wander the horizon as the ship begins to bob among the rolling tides of the inlet and my hand grasps loosely at the white railing hoping to stabilize myself. In the distance a great eagle sits perched among the highest branch in the forest, surveying her territory. With a lunge she sweeps down and floats across the ripples in the sea searching for her prey. There is such majesty to these lands, such a natural power that it can feel overwhelming; I think we need more of this humbling feeling in our lives. A bald eagle surveying the situation below. The ferry enters a calm harbour as forms of human activity begin to surface. A jet boat races along the water, hopping as the waves don’t manage to serve as a deterrent. A log house peeks out from the woods glaring out at the view. Overhead a float plane churns through the grey sky tilting sideways as it makes its way around the bend. I’ve arrived in Ucluelet, and am quickly whisked away to another adventure on the water. I dive my feet awkwardly into the mouth of the green kayak I have been assigned and push away into the reflective waters of the inlet. With each paddle I feel myself becoming more at peace; less an intruder on the waters and more a part of the environment itself. As we glide along the banks of the ocean, a sea lion stares at us with an unimpressed look, fish dance in the cool waters, a sea star clings to the dark rock wall and, what is becoming the symbol of my day, a beautiful bald eagle swoops over head before settling on a sturdy branch of a tree overhead. A cool wind carries a fresh natural breathe I’ve been missing, a taste of the world the way it should be. A photo with a GoPro on my kayak in Ucluelet, British Columbia – A big shout out to out guide Jill from Majestic Ocean Kayaking in Ucluelet… she was awesome! With my arms aching from the paddle, my legs decide they haven’t explored the area enough. My dancing feet pull me through the bright green foliage of the Wild Pacific Trail, and again I am blown away by the beauty of this region. Tall cedars and firs stretch out into the sky chasing the clouds while at their feet a banana slug crawls precariously through the muddy path. At each turn a new view presents itself like a runway for the nature photographer. In the distance, the rocky shoreline dissipates into a sky shade of blue and grey. As the sun tumbles below the horizon, I can’t help but feel a smile peel its way across my cheeks. I look around and find myself alone among the rocks of one of the most beautiful places my eyes have ever set their gaze upon. A small fish struggles within a tide pool that has formed before a wave tosses itself in creating a dramatic natural rescue. I set my camera down and sit on a rock, not concerned with capturing the moment. It’s pointless to try to capture this sentiment on film, these instances are ones that can’t be felt by anyone else by glancing at your photos. Away from the race of the city and the stresses of earning a living, these are spiritual sentiments shared between you and nature, something I think we all need a little bit more of in our lives. 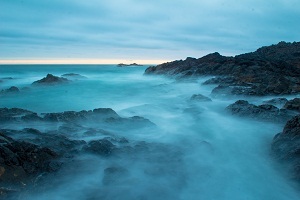 The coast at sunset by the amphitheater lighthouse on the Wild Pacific Trail near Ucluelet. Your writing and pictures are amazing. The last picture of the coast at sunset is exceptional ! Did you get a chance to eat some delicious salmon ? Hey Jesse – Thanks so much. I love salmon so I have definitely had a fair share. The sushi in BC is exceptional too, so I’ve been eating a lot of that! Wonderfully written narrative accompanied by some sweet photographs. Kayaking British Columbia looks amazing. Ted – You definitely have to get out and kayak the coast of BC. There were a couple times we were a mere couple feet from huge bald eagles. Incredible pictures Brendan. Cool site as well, lots of good info and insight. I will be following!